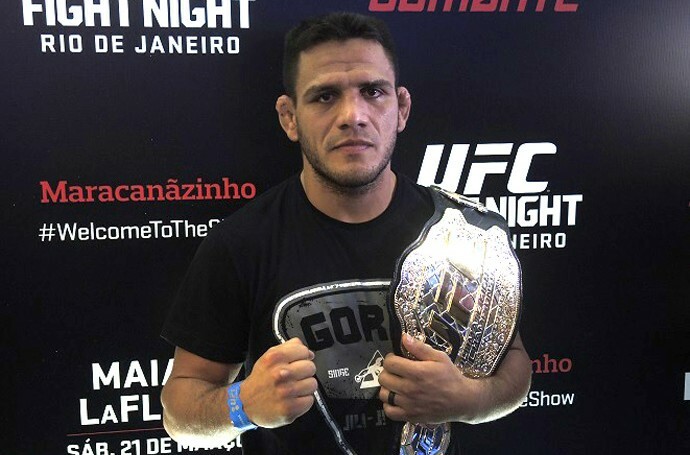 RDA on Cerrone: "He was already caught doping. I'm not a friend he can joke with"
Discussion in 'UFC Discussion' started by orlandod, Aug 19, 2015. "I think that for him to joke about this it's kind of ridicule. This guy doesn't have a clean history and can't talk about anybody. He was already caught doping, and I haven't, so that pissed me off. He's talking about me a lot, and I think our fight is gonna have a personal side to it and that's better for me. I'm focusing 100% on this fight against him and he won't get to me. I'm experienced on that. I'm a fighter and I did it to Diaz. It was so personal that it ended the way it did. That helps me even more"
"He's joking about it, trying to be all funny, but I work seriously, I'm not his friend and I dont intend to be. I'm not a friend he can joke with, I'm waiting for the day when I'll beat him again"
"The date was good. I wanted to fight again this year, so fighting at the end of the year was perfect. My knee is almost 100% and I'm almost clear to do some hard training, but we are still far away from the fight, like four months. I'm gonna do some adaptation this first month, not going too hard, and then, next month, I'll have other three months to go hard. I don't think I'm gonna be cautious about kicking. I was afraid to do it agains Pettis, but until I fight Cerrone I'll be 110% and it's gonna be ok. It was not a serious injury. It's just a complicated thing to treat, but it was the first time I had a knee injury"
I like Cerrone but the last time he talked this much he got destroyed by Pettis. Is using a diuretic considered "doping" really? Using something to help you cut weight is a bit different than taking steroids for whatever reasons. Shows how abysmal drug testing is in the sport when every fighter accuses everyone else of using peds. It's beyond pathetic and detrimental to the sport and everyone under contract with the UFC. It's like the go-to trash talk these days. Diuretics aren't PEDs, and the one Cowboy popped for 27 fights and 8 years ago is a poor masking agent. If Cerrone were Brazilian would you be asking this? which really has very little to do with RDA vs. Cerrone. Not really. Using anything to benefit going into a fight is doping IMO. if you can't make weight without it, you're cheating. So much lame trash talk since Conor hit the scene. Wait... why can't you use diuretic to cut weight? how does that enhance you come fight night? Taking a diuretic is pretty stupid in most cases and IMO shows a lack of discipline or dietary/knowledge on cutting but wouldn't consider it the same as cycling steroids. I'm stoked for this fight. It'll be incredibly interesting if it goes to the championship rounds if it does. Maybe RDA puts Cowboy's lights out like he did to George Sotiropoulos. Or maybe Cerrone catches him with a submission... I'm stoked for this one. F Cerrone. It's not a joke to say someone is using steroids. Cerrone should just stick to his farm because I see him losing again to RDA. 1. Because if you need it to cut weight, you're bigger than you can naturally cut from.